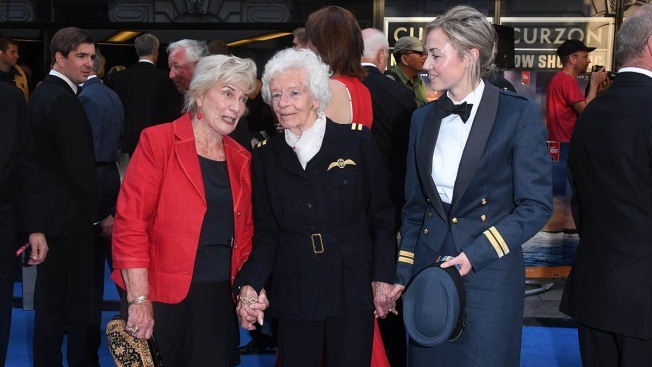 In this file photo, RAF Veteran Mary Ellis (center) attends the World Premiere of "Spitfire" at The Curzon Mayfair on July 9, 2018, in London, England. Ellis flew hundreds of planes for the British Air Transport Auxiliary during World War II. She was one of the first 3 women to fly a Meteor jet for Britain's Royal Air Force. After the war, she became a private pilot chauffeur. Mary Ellis, one of the last living female pilots from World War II, died this week at 101, Air Chief Marshal Stephen Hillier said on Twitter. The Royal Air Force confirmed her death. As part of the Air Transport Auxiliary (ATA), Ellis flew 400 Spitfires, a single-seat plane used by members of Britain’s Royal Air Force. She also flew 47 Wellington bombers alone, according to BBC. After learning that women pilots were sought in an advertisement on BBC radio, Ellis joined the ATA in 1941, BBC reported. In a tweet, British Prime Minister Theresa May said Ellis was "truly a pioneering female aviator." "Meeting her just last month to celebrate the centenary of the Royal Air Force was an honour," May said. "She was an inspiration to so many. My thoughts are with her many friends and family at this time." In total, Ellis flew 76 different types of aircrafts, according to Melody Foreman, who authored Ellis’ autobiography. In 1945, Ellis received an invitation to join the Royal Air Force and was one of the first women to fly a new Meteor jet, according to Foreman. After the war, she became a private pilot chauffeur. Historian Dan Snow called Ellis “one of Britain’s greatest aviators” and said he took his kids to meet her last week. RIP Mary Ellis (age101) who flew over 1000 aircraft for the Air Transport Auxiliary incl 400 Spitfires & 76 different aircraft types. The death rate in the ATA (1 in 6) was higher than in Fighter Command. She and the other heroic pilots were true legends.